Featured » The herons are back! We are delighted to report that the Pacific great blue herons have returned to their current nest site in Stanley Park for the 14th consecutive year. Our first count on March 10 revealed 67 adult herons occupying 48 nests (so far) out of 126. They began arriving in the past week to the trees that tower above the Park Board’s Administrative Offices and the tennis courts. 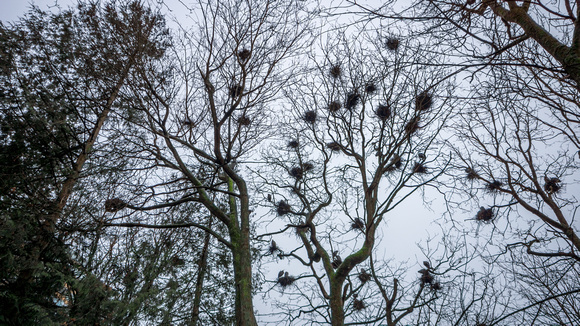 Heron nests in Stanley Park, 2013. Photo by Michael Schmidt. Last year, SPES counted 122 nests in the colony and 81 of these were occupied by heron pairs. In total, an estimated 156 young herons fledged from the colony in 2013, about 10 more than in 2012 and 57 more than in 2011. SPES staff works with volunteer monitors to collect data which is then passed on to researchers with the Canadian Wildlife Service and BC Ministry of Environment. More details can be found in the Stanley Park Great Blue Heronry Annual Report 2013. The gates of the fenced areas below the heronry are secured by Park Board staff to reduce disturbances to the heron colony and to protect passers-by from falling debris. In 2010, barriers were applied to the nest trees to discourage predators such as raccoons from climbing the trees. Dog owners are reminded to keep pets leashed in order to avoid disturbing the nest area. The Pacific great blue heron has been designated “special concern” under the Species at Risk Act. The Stanley Park colony seems to thrive in the face of human disturbance, but in other parts of our region development is infringing on much of the heron’s habitat. You can help! 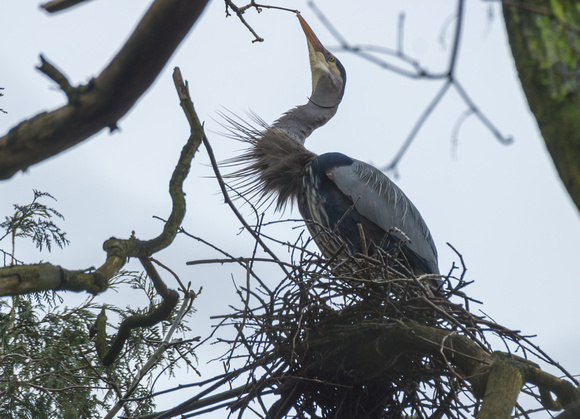 Consider Adopting a Heron Nest which supports efforts to learn more about these amazing birds and protect their homes within Stanley Park. Heron on nest, 2013. Photo by Michael Schmidt.